Qualification: I really am one of those “rabid” Outlander fans of both books and TV show (see the links to other Outlander posts at the bottom of this one), but I call it as I see it. I took most of the adaptation’s departures from the book in stride and appreciated the season finale’s brilliant aspects at face value. It was lovingly deep thinking about this last episode and the season as a whole that made me aware of the issue I discuss here. Since everyone else is talking about character journeys and actor performances, which I, too, find fascinating and impressive, I thought I’d approach from a different angle: the show’s story structure. Spoilers ahead. Pained, visceral reactions to the horrors of the Outlander Starz season 1 finale testify to Black Jack Randall’s icy impact on Claire and Jamie’s relationship. That is as the story and the show intended. Unintentionally, Jamie’s oddly rapid recovery from fever and mental anguish further cools the blood. But it’s the beginning of Claire’s confession in the chapel that drops a treacherous icicle spear into the structure of the show’s first season. For such an engaging, steamy, now-classic story and its vastly entertaining TV adaptation, the resulting damage saddens me–though not quite as much as do Claire’s attempts “To Ransom a Man’s Soul,” with tearful pleas to Jamie not to give up on their life and love. But the source of this cold stab may not be what you think. During the season finale of Outlander, protagonist “Claire Beauchamp Randall Fraser” begins her story to Father Anselm at the monastery by saying she arrived in the eighteenth century from 1945 “eight months ago.” Not “several,” not “last fall,” not simply “months ago.” Exactly eight. Hearing this immediately struck me with surprise and confusion, and I don’t think I’m alone here. How did seven weeks of the first half of the season suddenly hurtle forward into another six months in the second half? Hearing Claire say “eight months ago” became an unwelcome distraction that raised unfortunate questions. The time scale imbalance itself could be forgiven if the storyline somehow survived unaffected, but it doesn’t. Instead, the plausibility of outdoor actions and events strains against its crippling entrapment at the cold point of the spear, undercutting the immense care taken in the construction of historical and narrative realism in the season’s first half. Although the starting time of year in the book differs from that in the show, surely there were ways production could be true to the story without removing major organs from the time line, even in the modified seasonal arc. The results unfortunately fail to manifest any of those presumed possibilities. Let’s examine the evidence. In the show, Claire time-travels through the stones on the eve of Samhain, October 30. During episode 108, “Both Sides Now,” Jamie tells Claire it will be “Yuletide by the time [they] get back to Leoch.” True enough: In episode 109, “The Reckoning,” observant viewers will notice that evergreen swags with white flowers and red berries newly bedeck Castle Leoch’s thresholds, hearths, and bed posts. Also during episode 108, Frank Randall provides a more specific indication of timing as he challenges Reverend Wakefield’s theory of Claire’s getting lost near Craigh Na Dun, being swept down a river by the current to a cave, and “living on fish and frogs—for seven weeks.” At seven weeks past Samhain, with the parallel promise of Yuletide’s approach, late December has arrived. With three distinct pieces of evidence, winter has not yet arrived and Christmas still approaches as of episode 109. Early in 110, “By the Pricking of My Thumbs,” Claire deals with Laoghaire’s episode 109 attempt to seduce Jamie as well as her placement of an ill wish under their bed. Based on the scenes done in the castle, along with the winter coats, shawls, hoods, and cape-like plaid layers worn by the cast, it’s clear that it is still Christmastime or, at the latest, early January. The problem is–although only days pass between Claire and Geillis’ capture (ep. 110) and trial for witchcraft (ep. 111), and between the trial and Claire’s rescue by Jamie–the outdoor scenery during the last twenty minutes of episode 111, “The Devil’s Mark,” shifts dramatically from early winter to early if not mid-spring. The Outlander TV adaptation has skipped winter altogether. On one hand, as a native Ohioan who has endured two abnormally brutal winters in the past two years, I can empathize with the impulse to create a more hospitable fictional world to dwell in. On the other, Outlander‘s actors are steadfast, adventurous players. The crew consist largely of hardy Scots. A clan of unflinching producers and writers have repeatedly claimed efforts to be as authentic as possible in adapting this violent action-adventure, historical romance with sci-fi elements. Combining all these factors, one would think this TV team, if any, could withstand a single Scottish winter, especially if an out-of-season shooting schedule were to necessitate a manufactured one. Winter’s omission marks a surprising sloppiness not evident in other aspects of the production. Its absence might not have been as noticeable had the writers refrained from exact time references in dialogue. “Eight months ago” could simply have been “several months ago” with less negative impact, though story incongruities of seasonal climate and daylight pose a larger production dilemma. Climate-wise, skipping ahead in the story is evident because winter conditions are just as missing from the show as the time span itself is. Another prime example: If it really were winter in episode 111, Claire and Geillis would have been much colder than they appear to be while coatlessly awaiting their fate in the outdoor, underground thieves’ hole. To rule out the possibility of later compensations for mid-season time warping, let’s take the viewer’s perspective of the time line in reverse from the announced endpoint. A closer look at the sequence and duration of events helps to illustrate how the time problem–like Jamie’s lingering psychosexual conflation of Claire and Black Jack–remains unsolved through episode 116’s final credits. Eight months after October 30 means the story resolves in late June, early July, come the finale. 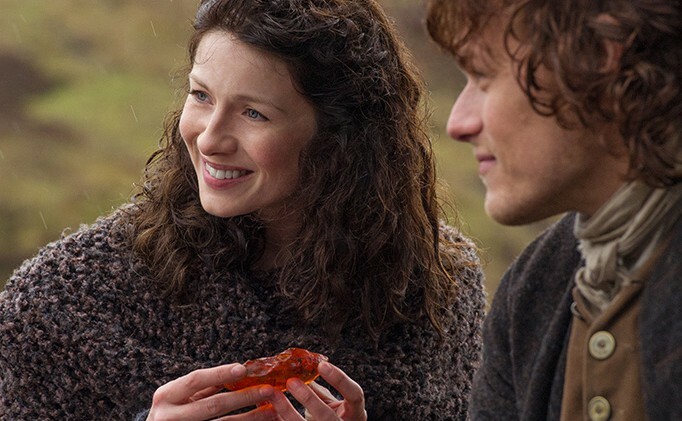 It is then, just after Jamie’s rescue from prison, when Claire tells her story to Father Anselm. Only a few days pass between the start of the rescuers’ efforts in episode 115, “Wentworth Prison,” and the success of that rescue in episode 116. Only about two or three days from the end of episode 114, “The Search,” through episode 115 stand between Claire and Murtagh’s recruitment of men for Jamie’s rescue and Claire’s ejection from Wentworth by Randall. After Jenny gives birth during episode 113, “The Watch,” the next opportunity for a significant passage of time is in episode 114, “The Search.” Here, the story clearly takes at least a couple of weeks, if not a full month. But even if it took as many as two months, there would still be far more than a month’s gap in time unaccounted for. Prior to these events, only “several days” (ep. 111) pass between Claire and Jamie’s departure from Cranesmuir and their arrival at his home estate of Lallybroch, just as only a few days mark the span between their arrival home and Jamie’s capture by the British after joining the Watch on a raid. Two weeks maximum, all told. In sum, we established earlier that episode 109 resolves in December, and now we also know that no more than eight weeks track back from the season finale to episode 110, which exists within 109’s Christmas time frame. A total of about 60 days between Christmas and early July. And I believe this estimate gives the show writers and producers the benefit of the doubt as much as possible. Ironically, the truncated year of 1744 mirrors the two-month interval of the season’s first half, the end of 1743. It’s simply not possible to skip four full months of a year without accounting for the story’s arc across the gap, which the Outlander Starz writing and production team have not done. In order to make sense of the total amount of time between episodes 111 and 116–stated by the characters as around “Yuletide” (Jamie, costumes of castle and cast) and “eight months” since October 30 (Claire), respectively–it would have to be more like early May in episode 110, “By the Pricking of My Thumbs.” Again, the second half of the season represents a total of six narrative months. It does indeed start to look like spring as early as episode 108, especially in the woods where Claire and Willie await the return from Jamie’s meeting with Horrocks. But since the whole group has yet to return to Leoch for Christmas, according to Jamie, we know it can’t yet be spring. Therefore, the viewer’s expectations of approximate time passage for a TV show’s seasonal arc are grossly violated in the Outlander Starz series’ first season. For one thing, the imbalance is stark: less than two months’ time for the first eight episodes, and a minimum of six months—three times the number in the first half—for the second eight episodes. But, for another, bypassing the winter season is a more egregious error. And why make it? Writing adjustments alone could have minimized the impact, so it shouldn’t have been much of a budget issue. In production terms, because the creators made no apparent attempt to pretend winter occurs by their use of Scottish scenery in the season’s second half, noticing the lack of winter is easy for the audience to do. They must have known we would notice, and somehow the choice was still approved. Budgetary constraints might, in part, explain this fact. Of all the issues with the book’s first adaptation, a Scotland without winter may not be the worst, but it certainly bothered me when I first saw episode 108, “Both Sides Now,” and it continued to disrupt my suspension of disbelief over the next several episodes. Add to this that, when we’re supposed to be focusing so intently on the emotional roller coaster and unprecedented drama of the final episodes, our main character Claire plainly states the exact passage of time. The result? Any sense of a carefully woven TV plot structure–which means viewers wouldn’t notice the structure at all–freezes up, a hardening quickened by Jamie’s miraculous recovery from Randall’s twisted form of aversion therapy on him toward Claire, and by the mysterious disappearance of Jamie’s physical fever. But it is winter’s loss that leads us into the cold. For fans of the book, and even of the show despite these flaws, let’s hope Ronald D. Moore and company find a way not only to translate Diana Gabaldon’s second Outlander book into sound plot structure and story pacing, but also to maintain the depth, complexity, and beauty of season 1 in a completely new setting. Perhaps with much of France being filmed inside Scottish studios, the hurdle of suspending our disbelief about climate and timing will prove more surmountable. As Claire replies in season 1’s second episode, “Castle Leoch,” to Colum’s query as to whether her journey to France involves “a joyous occasion,” so we the viewers must echo: “One can only hope.” And perhaps the northern hemisphere’s imminent entry into summer will dilute a lost winter’s ironic chilling effect. That won’t relieve us of Droughtlander’s irksome symptoms, unfortunately. Let us be industrious, then, in seeking solutions. Perhaps our resourcefulness can inspire the making of a season 2 Dragonfly in Amber encased in a more smoothly formed and comfortable home. All of its inhabitants deserve it. Note: Filming for season 1 began October 2013 and concluded September 2014. Filming of season 2 is under way as of early May 2015, and the plan is to air the first episode in spring of 2016.